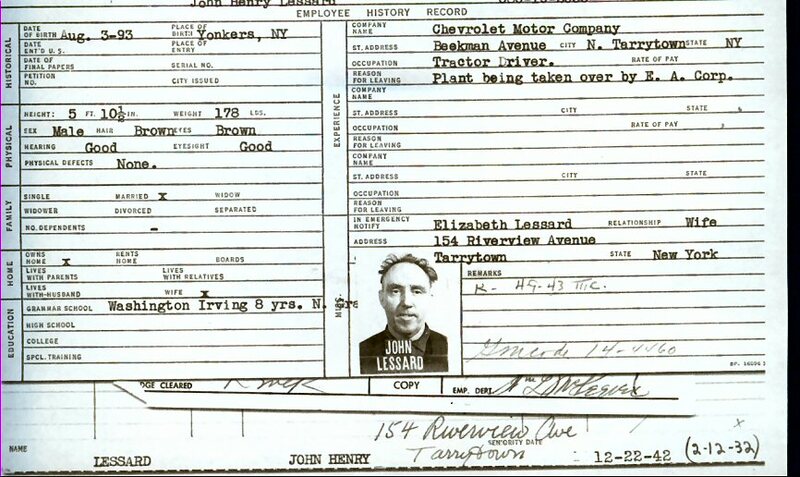 Comments: John Henry Lessard (Nee: ) | Tarrytown Ny USA | 1941-1960 | Comments: d Dec 1981 - This record is one of approx two thousand world war 2 era records that were recovered from a manufacturing plant in North Tarry Town NY by Mike Kane of Mahopac NY. Each of these records tells a large part of who the individual was , where they were born and where they lived .Each record also contains a head shot photo of the individual. Since his discovery Mike has been trying to get each of these people home.. as of this typing he has been successful with about 300 . . Mike contacted DeadFred to help him get these records into the hands of family.Over the upcoming months we will be adding all the records to the Archive .Mike is the primary contact his email address is gardengate54@hotmail.com .. if for some reason his email is not working contact webmaster@deadfred.com . To see more of his records scroll to the bottom of this record and click on the Link .